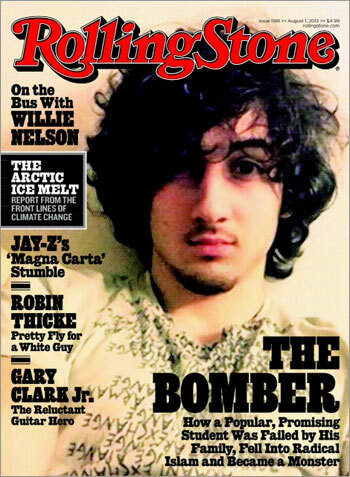 Rolling Stone‘s decision to feature Dzhohkar Tsarnaev, the suspect in the Boston Marathon bombing, on the cover of its latest issue has generated a public reaction that I cynically suggest is probably what they expected. Late Wednesday morning, both Tedeschi Food Shops and CVS pledged not to carry the Rolling Stone issue in its stores. On its Facebook page, CVS wrote:”CVS/pharmacy has decided not to sell the current issue of Rolling Stone featuring a cover photo of the Boston Marathon bombing suspect. As a company with deep roots in New England and a strong presence in Boston, we believe this is the right decision out of respect for the victims of the attack and their loved ones. And from Tedeschi’s Facebook page: “Tedeschi Food Shops supports the need to share the news with everyone, but cannot support actions that serve to glorify the evil actions of anyone. With that being said, we will not be carrying this issue of Rolling Stone. Music and terrorism don’t mix! CVS’s statement is understandable. It’s less a free speech issue than a business decision. They don’t wish to offend their customers. Tedeschi’s statement makes less sense. Having not read the piece, Tedeschi can’t definitely state that the article “glorifies the evil actions of anyone” (unless Tedeschi is referring to the feature on Robin Thicke). Also, the line “music and terrorism don’t mix” reveals an ignorance of Rolling Stone‘s regular content — much of it is political and not related to music at all. Catherine Parrotta reported on Twitter that Boston Mayor Thomas Menino believes the cover is a “disgrace” and that it should’ve featured first responders instead. The mayor already has one job with a limited career path, does he really need to try his hand at publishing? I think this all speaks to a prevalent mindset that fame = good. It doesn’t matter how the fame is achieved (any reality TV star, for example). The bomber is objectively famous. We all know (or at least should know) his name. That doesn’t make him Santa Claus or Marilyn Monroe. The fact that our culture has trouble making the distinction between fame and moral value is more an indictment on our culture. In-depth coverage of the victims of this awful act and the heroic men and women who rushed to their aid is a great thing. However, it’s not the same as also examining the twisted mindset of the man accused of perpetrating it. The latter should not preclude the former. I haven’t read the piece yet but I presume it does not “glorify” him nor do I think it will inspire young people to view him as “cool.” My biggest objection is that Tsarnaev pleaded “not guilty” to the crimes. As implausible as that is, he has not yet been convicted of anything, and the article seems to take the position that he has. Thanks for pointing this out! I am going to run right out and buy a copy — and not at CVS, either. At a good,traditional NJ newsstand. Btw, Tsarnaev HAS to plead not guilty, or there won’t be a trial. And we all need a trial.